Ooh, you’re a weird looking creature! But enough about you, let’s take a closer look at this lovely spider instead. It took a few days before I got a good look at this little recluse (because it was hiding from me, not because it’s actually a Recluse Spider, which is a truly evil looking thing in America. Seriously, Americans, how do you guys live over there? If it were me I’d have flamethrowered the entire continent by now, just to be sure). The neat little web appeared across a side window last week, but no owner was to be seen. One morning a couple of days later as I opened the curtains this tiny terror rushed into the corner of the windowsill. I got my camera and returned to apprehend the miscreant (a few days later, but let’s not spoil the narrative here), only to find it back out in the centre of it’s web, eying up a yummy fly which was lurking nearby. 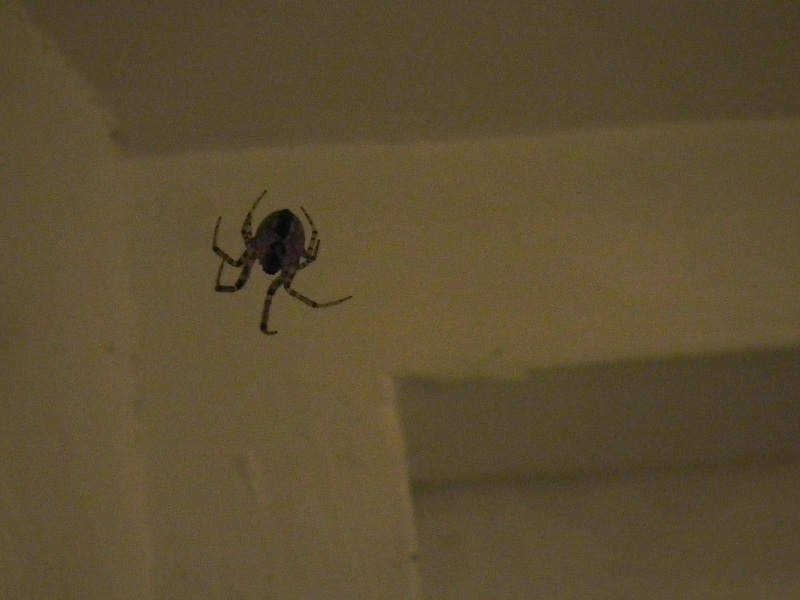 My house has so many spiders. Why are there also so many flies? Or maybe that’s why there are so many spiders here, because of the rich source of flies which appears to be somewhere within this flat. Hmm, maybe I should stop leaving the rotting pig carcasses out on the sideboard after the pagan ritual every second sunday of the month. Anyway, I was only getting a profile view from this ‘ere spiddy which isn’t very photogenic as it just looks like a blob on a twig. I un-zoomed the camera and moved it closer to try to get some more detail on the body in the dark, and the darn blighter span itself round to face me. I was watching in my viewfinder, and it looked like that annoying hamster thing from youtube, but with the added spider factor of imminent leaping-on, biting and death. I should probably see a hypnotist to try to wipe the childhood viewing of Arachnophobia from my memory. I still check under the toilet when I go. It moves when you move your hand, John Goodman, it moves when you move your hand! Sorry. So it didn’t leap on me and kill me. It just looked a bit more scary, with all legs in view. A day later the fly was gone, and there was a strangely large white blob tucked away in the corner of the windowpane. That could’ve been me. Scaryness: 4. Tis but a small thing. But sometimes they can be the worst, as proved by it’s speedy reactions when my camera got a bit too close for comfort. It’s keeping the fly population down, which is nice, but if it continues to lurk menacingly just behind my curtains, it might be forced to pack it’s bags!